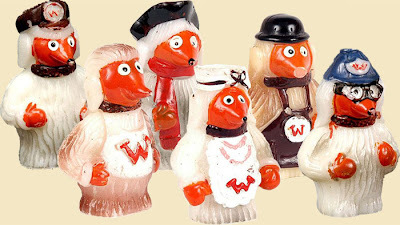 Who remembers the Wombles plastic figures in the 1970’s? The Wombles were on our sets for the decade and I remember a trip down the post office each week to pick up one of these figures. I think there were seven to collect and they cost just around 5 pence in those days. All of the Wombles plastic figures were around two inches high (that’s 5 cm). There was Uncle Bulgaria, Madame Cholet, Tobermory, Orinoco, Wellington, Tomsk and Bungo. Made from moulded plastic but each one hand painted. These are available for collectors on ebay and fetch around £20 if there in good condition. Mine were chipped to smitherines due to the amount of Corgi and Matchbox accidents there had while riding around in my toy cars!